As we’ve described in our first two installments in this Craftsman series, Bungalow home design here in the US was heavily influenced by the Arts & Crafts movement, and led to a unique American architectural style known for modest but lovely homes. The architecture focused on a functional arrangement of spaces with windows, built-in furniture and trim details that reinforced the goal of integrating beauty, practicality, warmth and comfort. Hand-craftsmanship was key; houses boasted a rich palette of woods, tile, pottery, stained glass and textiles. 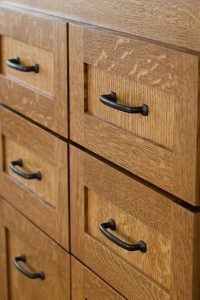 In this blog, we’ll cover the major interior elements of traditional Craftsman homes, and offer advice on how these same elements may be interpreted in a more contemporary manner today. 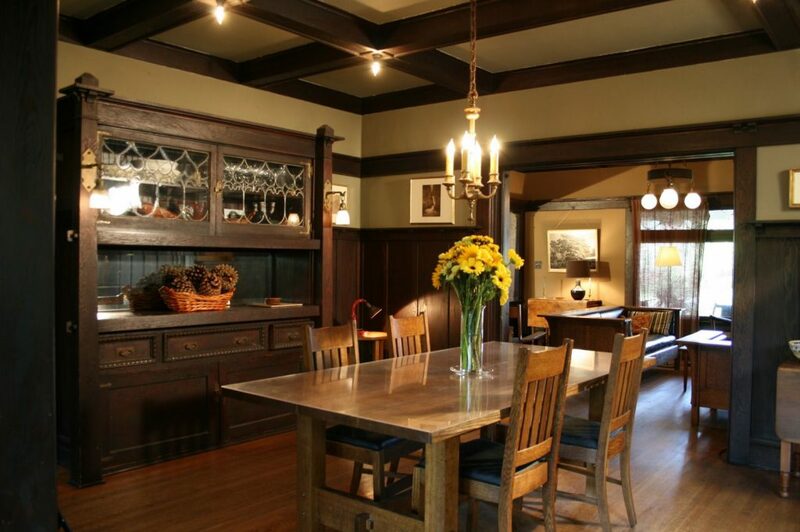 Traditional Craftsman homes typically had floor plans with rooms that were open and flowed one into the next. A living room might have a “cased opening” (wide door opening with trim around it, but no door) which opened into the dining area, making these smallish rooms feel larger and more spacious. The focus of these living spaces was usually the fireplace – designed to be the main focal point in the house. 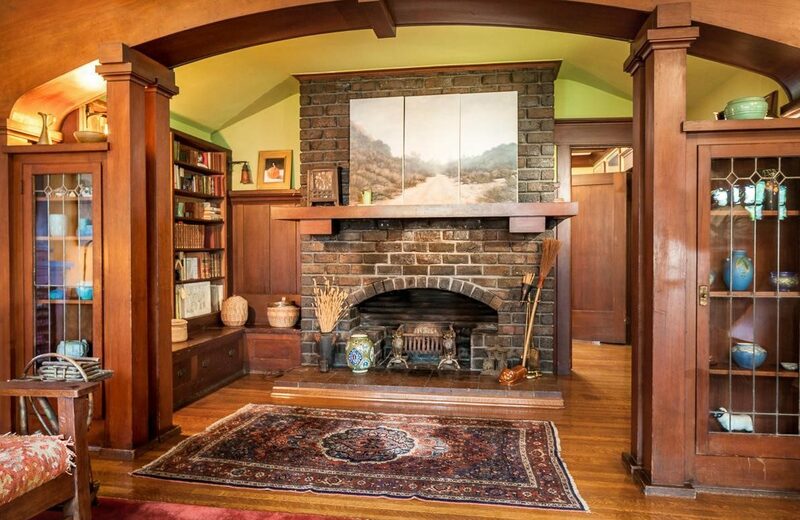 Often an “inglenook” was designed around the fireplace: built-in seats and bookcases, along with a textured brick or tile surround and prominent wood mantel, ensured maximum visibility and impact for the “home and hearth” of the house, inviting one to snuggle up and retreat from the world! In the two photos below, see how we designed fireplaces in two very different homes: one is an island cabin featuring lots of bookcases, nook window seat, and a mantle alcove to achieve that same cozy quality. 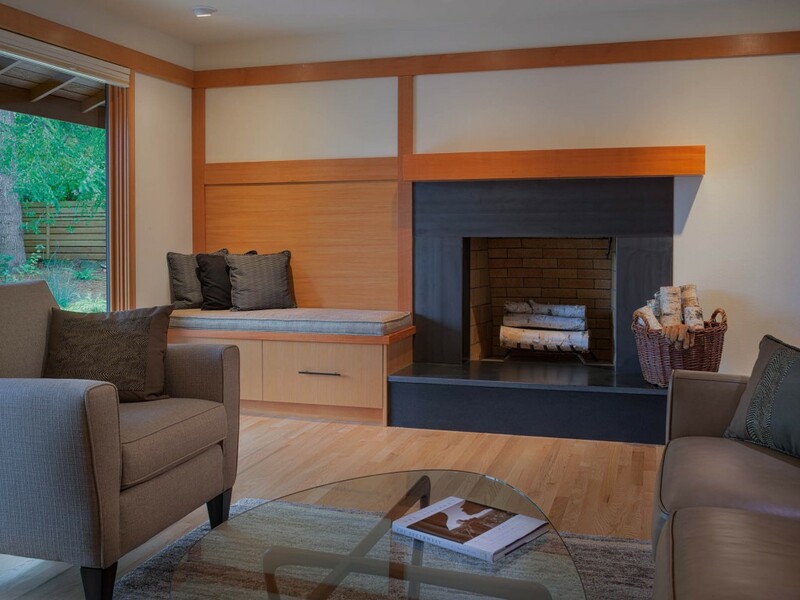 The second photo is from our Daring Downsize, a recent remodel of more contemporary home but it still uses the same technique of built-in bench nook and wood paneling to impart a warm intimate space close-in to the fireplace. 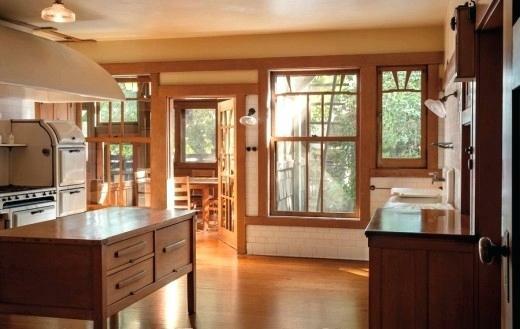 Wood was always a key material throughout these old Craftsman homes, seen left in the Island Cabin. Paneling or wainscoting with plate rails on top was a common means for display of knick-knacks, floors were usually oak and often featured decorative ribbon details around the perimeter of rooms, and ceilings were often low and featured coffers to demarcate different spaces. As a result, these homes were rather dark and poorly lit, as you can see in this next photo. Today’s homeowners often want a lighter and airier feel to their interiors, which can pose a challenge to the Craftsman purist! 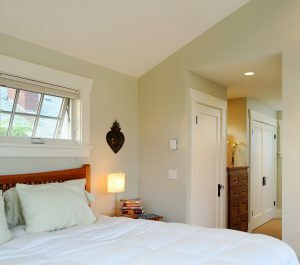 See this next photo of our Queen Anne Four Square where our clients wanted a lighter touch within their craftsman home. 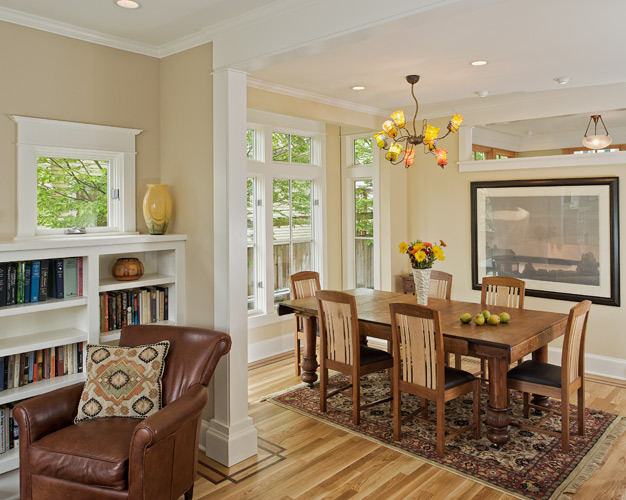 We incorporated classic Craftsman elements but used a mix of painted and natural wood to create a cozy but more light-filled space. Here, living/dining/family rooms are all open to each other via cased openings or partial height walls, with ceiling coffers to demarcate spaces. 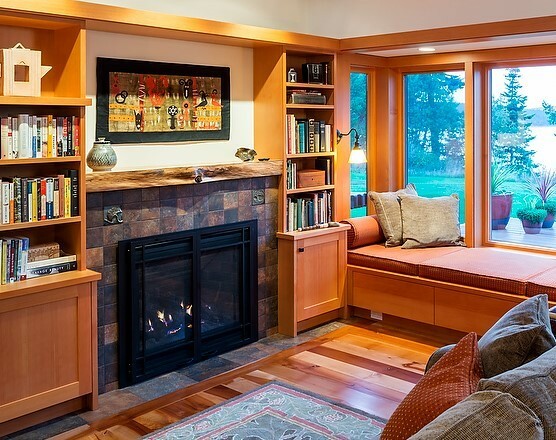 Note built-in bookcases and small upper windows flanking the fireplace (just to the left of the picture frame), and dark ribboning in flooring perimeter. The adjacent kitchen (next photo) transitions to fir cabinetry within these same painted spaces. Traditional Craftsman kitchens were small and simple, not having all the appliances we now enjoy. But they did feature windows for better lighting, built-in cabinets, and usually a subway tile backsplash! Below is the kitchen in Greene & Greene’s beloved Gamble House in Pasadena. 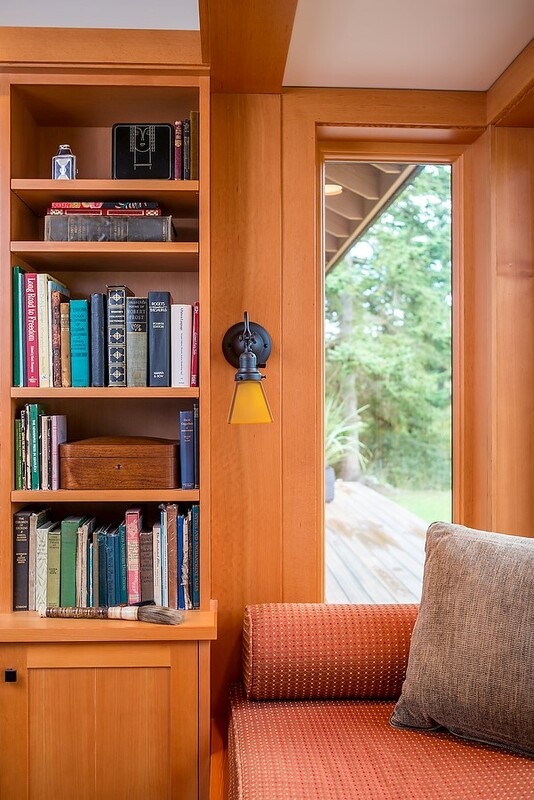 More modest homes often featured built-in seating for dining nooks. 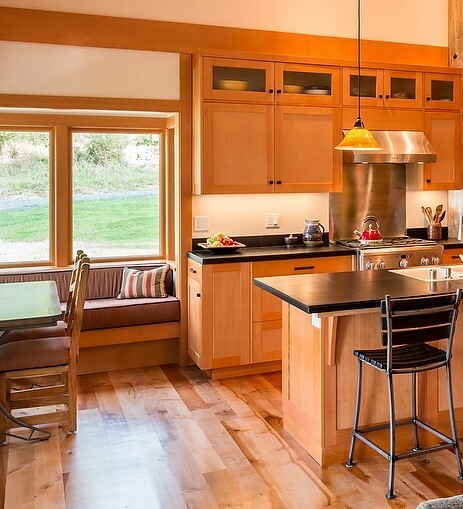 Our Island Cabin kitchen features a corner window seat and dining nook. 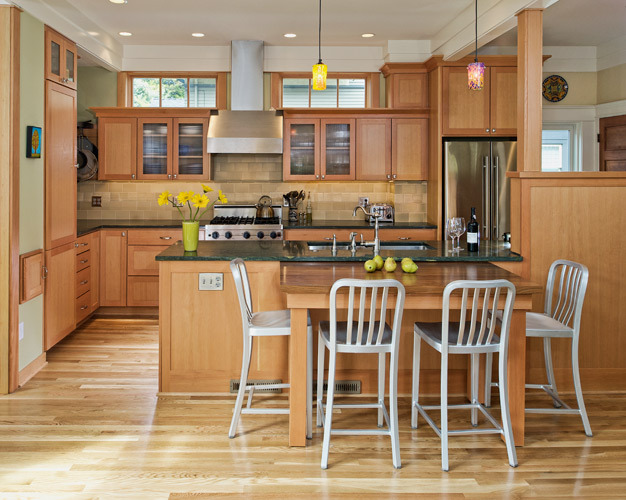 Note the very simple fir Craftsman cabinetry, including Craftsman style brackets at the counter overhang. 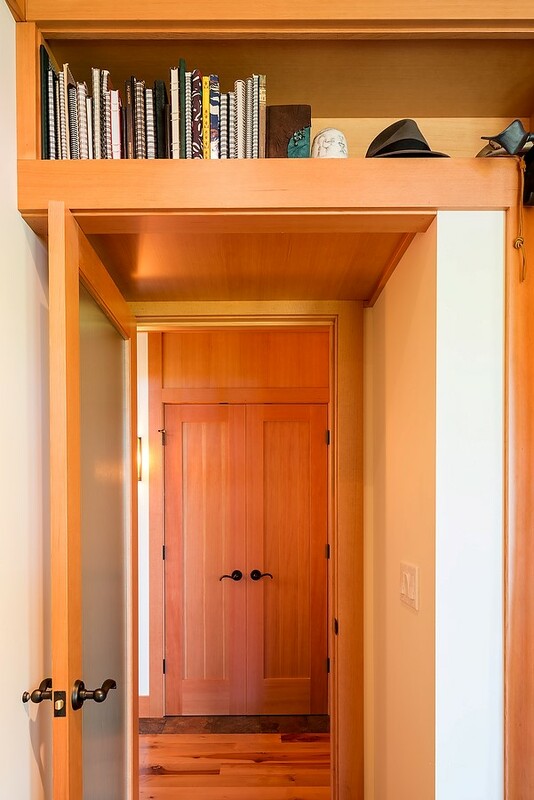 And below are a few other photos of our recent Craftsman projects, to demonstrate how these same principals can be incorporated into various other spaces within a modern home. Note the built-in oak dresser, and classic Craftsman-style window & door trim on the Craftsman Charmer. 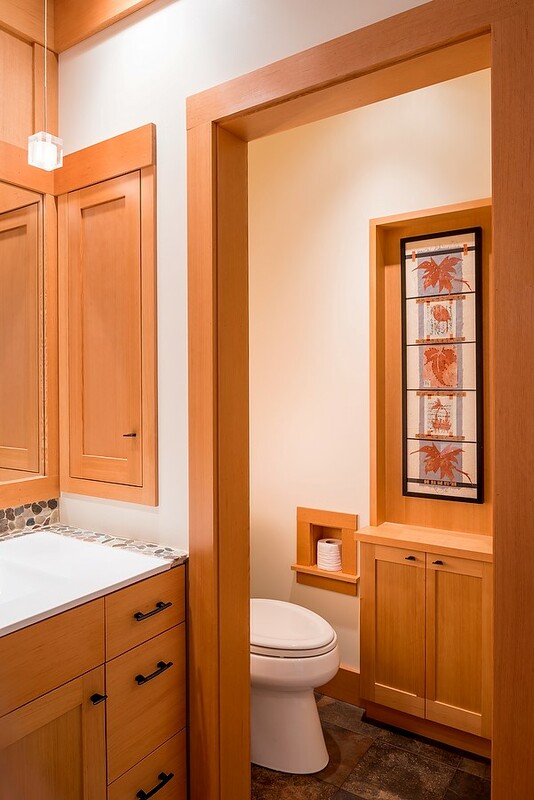 A couple of bathrooms: natural materials, simple fir cabinetry, built-ins & paneling! 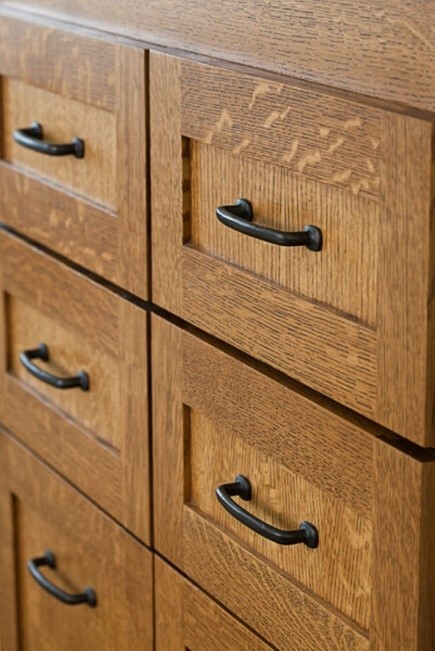 Dark bronze hardware & fixtures is often our finish of choice. Seen here are the Island Cabin and River Run residences. 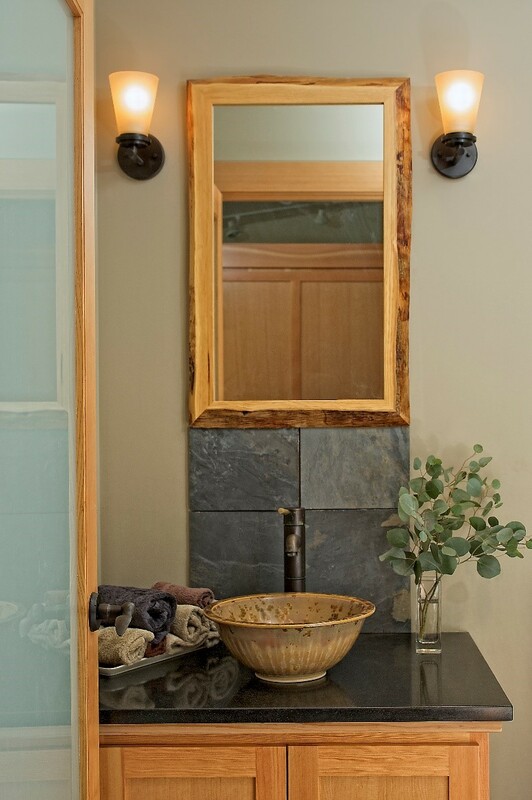 Built-in details on the Island Cabin help create scale and coziness, and impart a lovely hand-crafted patina to a home. 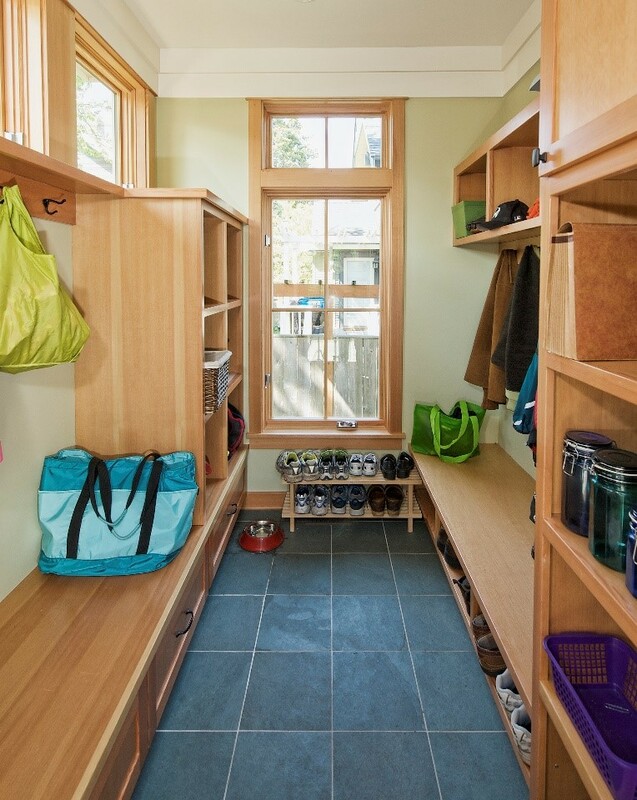 And last: a mudroom to manage all of life’s stuff!